Hard to offer help and be "Christian-like," when there's a chance there are wolves among the sheep. 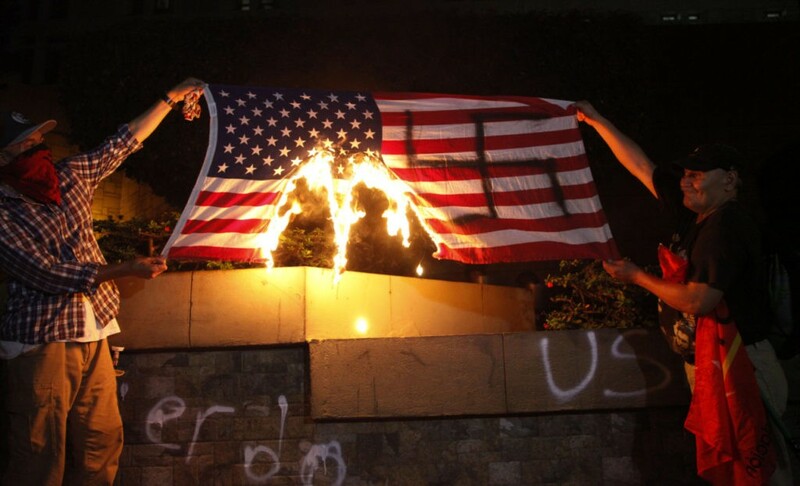 These two could live in InTheLight's house - they don;t seem to want to burn the Canadian flag. InTheLight - That would be ok, right? I like how you assume she's an abusing mother... isnt trying to get her kids to a safe place to live the complete opposite of abuse? Is it not safe in Mexico? Or does the whole of Mexico need to migrate to the US too in order that THEY are safe? Asylum should be sought at the first safe haven. That has not been done, hence the mother is abusing her kids by subjecting them, willingly, to unnecessary suffering. This is not even pretending to be about asylum. These people just want to come into the US. I guess all of us can pick the country we want to live in. Move there, don't bother to apply for citizenship, get on their welfare system and enjoy.. That ought to work out well. Indeed. The bleeding hearts would have the entire population of every country suffering economically pour into the US (or any other richer country)- as long as they didn't have to put them up and pay for them themselves . Gubmnt pays from their free money. They won't have to because my government has refugee/immigrant solutions in place. You saying trump supporters are godless? Bet you aint never done one thing jesus like in your life. It's not up to the supporters to be Jesus-like, it is up to your President to act in a Christian manner and show compassion and heart and generosity. Do you think it is behaving in a Christian manner to allow anyone who wants to break the law to break the law and then pay their way afterwards??? If that logic is to be followed we should be Christian and release people from prison showing them compassion, heart and generosity??? Or is it compassionate to only allow certain law breakers to avoid the consequences of their actions. If you have children is it compassionate to allow them to go against your rules, then reward them for it? To me, to give an ear to their hardships and desire for a better life is compassionate and generous, but to offer real help would be Christian-like. Great, why do you guys ignore the fact that their is a process for applying for citizenship? These folks chose the lawless way. Does common sense tell you that it doesn't matter? Is it really that hard to apply for citizenship? I am talking about the process...the courtroom process...lend an ear then be compassionate. Ah yes, the compassionate years long waiting list where illegal immigrants don't even bother to turn up. That'll fix it, by jove. Do you blame them for not showing up with the lack of compassion? Ah - so we've got as far as - let them all in, get others to pay and don't complain if they don't turn up to court because the courts are not compassionate enough. yes, yes... I can see you know Democrat leftist policy really well. You are just missing the need to abolish ICE so no one can chase them down, then you're on message. I do feel good about donating to organizations that help people who are looking for a better life. Why chase them down if they are not harming anyone? In the past year, Canada has seen bursts of U.S.-based immigrants crossing illegally into Canada, mostly into the Quebec province that borders New York and other northeastern U.S. states. In August, Royal Canadian Mounted Police caught more than 5,500 people trying to illegally cross from the U.S. Those were mostly Haitian immigrants who will soon lose Temporary Protected Status as part of the Trump administration's phase-out of the TPS program that has protected more than 300,000 people from countries struck by war and natural disasters. Only about 8% of their asylum application have been approved, however, meaning the vast majority have been turned down and are being deported straight back to their home countries. Plenty for you to take in. How could you be so heartless? Why are these 5,500 poor souls not being let into Canada? Because they broke the law and are in the country illegally. Some do actually harm others too. An unhealthy percentage of them.